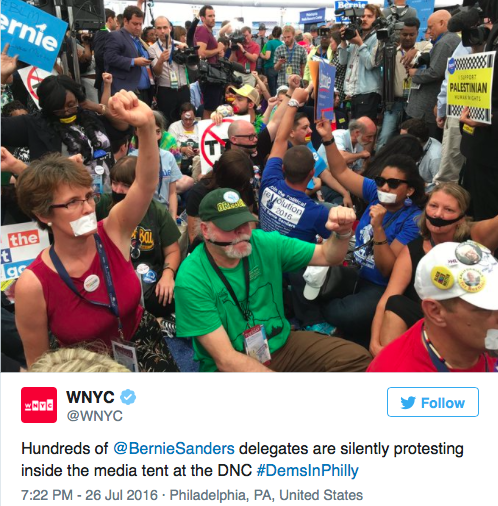 Based on an onsite news report, hundreds of delegates for Bernie Sanders organized a protest walking out on the Democratic National Convention last night in Philadelphia. While most of the media focused on the official roll call nomination of Hillary Clinton, hundreds of delegates quietly used word of mouth, Facebook and other means to stage a walkout during the actual live roll call vote. 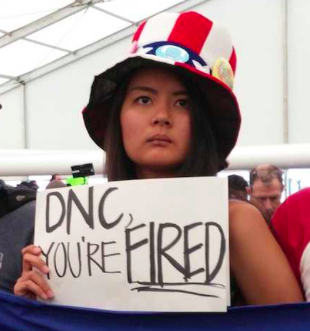 Yet no one seemed aware that hundreds of Bernie Sanders delegates planned to walk out of the Democratic National Convention in unison Tuesday, at the precise moment party unity was supposed to reach a crescendo. The walkout, which came as Sanders personally moved to nominate Hillary Clinton by acclimation, left hundreds of seat on the convention floor empty. It came after protests from Sanders delegates seemed to be fizzling out, thanks to personal pleas from Sanders and Elizabeth Warren, among others. The several hundred delegates stormed out of the convention hall before quietly sitting down and occupying the press tent, aware of how to maximize their leverage. Police surrounded the tent, and refused to let anyone in or out until the situation was resolved. It came together organically they said, percolating as Sanders delegates felt each other out to see which ones would be interested in protest. Eventually, they organized themselves in several secret Slack channels and Facebook groups, the largest of which had over 1,250 delegate members. Information was kept close to the vest, with word of the walkout only going out to many delegates by text message or word of mouth after they were sitting in the arena. One delegate, Dennis Slotnick described the moment saying, "I didn't know it would happen when the roll call voting began." Someone who's media status is apparently not credentialed took footage of the scene later. In the background you can hear Hillary Clinton speaking from the telescreen as video shows hundreds of empty delegate seats and allegedly a good chunk of the California delegation. It adds quite an Orwellian hue to the "official" eMedia narrative.